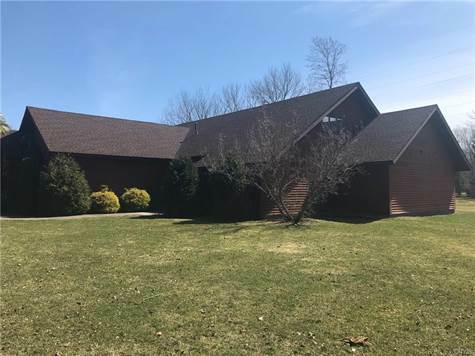 Homes for Sale in New York, Scriba, New York $189,900 1st Carriage House Realty, Inc.
ABSOLUTE STUNNING CONTEMPORARY HOUSE IN A NEWER DEVELOPMENT. FANTASTIC GREY/ BEIGE SLATE FLOORING IN HALLWAY, DINING ROOM AND 1ST FLOOR LAUNDRY. THE ARCHITECTURE OF THIS HOME IS STUNNING! SOARING CEILINGS IN MAIN, OPEN LIVING SPACE. WINDOWS GALORE LET THE SUNSHINE FLOOD YOUR HOME! LARGE KITCHEN W/ NEW STOVE AND REFRIGERATOR AND NEW WASHER & DRYER WILL STAY. FOLLOW THE OPEN STAIRCASE THAT LEADS TO THE SECOND STORY LOFT, ANOTHER GREAT LIVING-SPACE A FULL BATH AND TWO MORE BEDROOMS. THE ENTIRE UPSTAIRS HAS BRAND NEW WALL TO WALL CARPET IN A NEUTRAL GREY. THE DOWNSTAIRS FEATURES A LARGE MASTER SUITE WITH JACUZZI TUB AND A SECOND LARGE BEDROOM WITH BIG WINDOWS. BOTH BEDROOMS HAVE A DOUBLE DOOR ENTRY. THERE IS A LARGE PATIO / DECK FOR ENTERTAINING. CONCRETE WALKWAYS, MATURE LANDSCAPING, ... JUST BEAUTIFUL AND READY TO MOVE IN! TWO CAR ATTACHED GARAGE!